Being a quality assured company, providing quality is the prime motto of our company. We never compromise on quality of product. We also have a team of quality experts who keep close eye right from the procurement of raw materials to the final dispatch of finished consignments. These experts are also facilitated with advanced quality testing equipment to test the quality of the products. Moreover, they test our range on the various parameters to assure its efficiency, durability, reliability and quality. Providing client satisfaction is the main aim of our company. The international standards in manufacturing our products are maintained and are customized as per the client’s requirement. Our clients are very much satisfied with the timely delivery of the product range, flexible and reliable after sales services. We maintain a perfect relationship with the client to improve our productivity based on customer satisfaction. 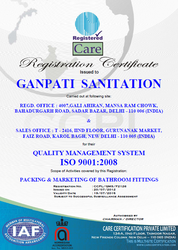 By providing all the facilities we owned the customers satisfaction in the market.